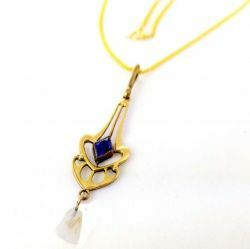 Featuring antique and Victorian lavalieres, necklaces, lockets and pendants in sterling silver, gold filled, 10k, 14k & 18k gold. 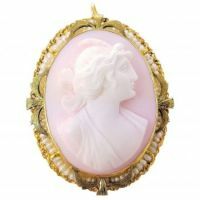 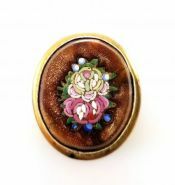 Choose from a selection of mourning jewelry, Victorian lockets, antique cameo pendants, Etruscan Revival, festoon style, early Edwardian and Art Nouveau items. 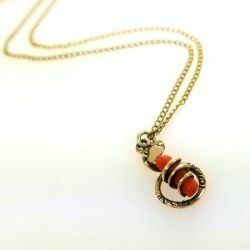 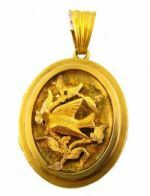 All of our antique and Victorian necklaces, pendants and lockets on this page are authentic with no reproductions mixed in this category. 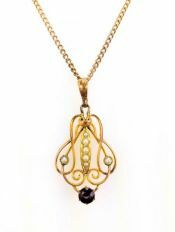 An antique filigree pendant with a European cut diamond accent and a natural pearl. 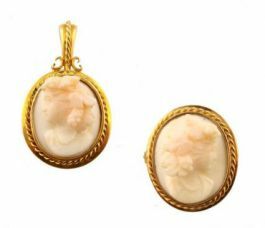 Has a baroque pearl dangle and seed pearl accents along the filigree frame and bail.